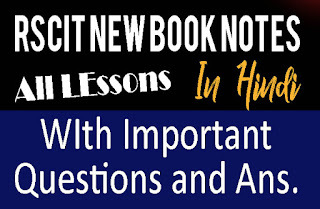 RSCIT Notes In Hindi 2019 | RKCL New Book All Lessons Notes with Important Questions & Answers Pdf Download : If You Want RSCIT New Book Notes In Hindi And English Language, So We Are Provide Complete RSCIT New Book Lessons Notes With Very Most Important RSCIT Exam Questions And Answers In Hindi 2019. We Will Provide You Notes Of All The Lessons In RSCIT Computer Course Book. So That You Can Pass The RSCIT Examination Easily. 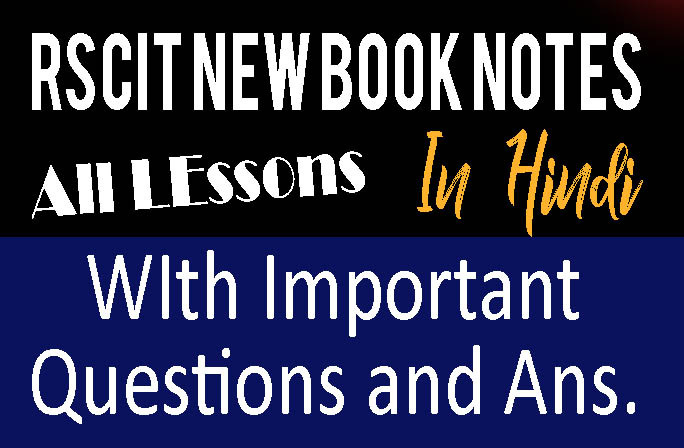 Along With This, We Will Also Give You An Online Test Of All Important Questions And Answers Of All The Lessons Of RSCIT Book, So That RSCIT Exam Preparation Is Good And You Get Good Numbers In Your RSCIT Examination 2019. Students Who Take Admission In RSCIT Computer Course, Are Given A Book Free From RKCL. The Complete Course Of RSCIT Computer Course Is In This Book, After Studying, The Student Can Easily Pass The RSCIT Computer Course Examination 2019. This RSCIT Book Cover Is Of Blue Color. And It Is Too Big To Be Visible, So Big That If A Student Sees It First, Then Once Definitely Thinks That "Such A Big Book Will Have To Be Read". Keeping This Problem In Mind, Notes Of This Book Are Being Provided By Lifiteaching YouTube Channel. So That Students Are Easy To Pass The RSCIT Examination 2019. RSCIT Computer Course Book, You Can See That in the Photo Below. This Book Has 16 Lessons. We Will Provide You With Notes Of All The Lessons Of A Tax. You Can Take Them By Clicking On The Links Given Below. 3.1 Computer System & GUI & CLI and More. 4.1 Internet + Browser + E-mail and More. 5.1 Online Banking + Bank Account + Cards and More. 6.1 E-commerce + Rajasthan Online Store + Online Shopping Website & More. 7.1 E-governance in Rajasthan + Bamashah scheme + Rajasthan sampark & More. 8.1 Single Sign On Facility + & More. 9.1 Information on Civilian Services & More. 10.1 Working with Mobile Device/ Smartphone & More.